OMG. I am finally back in my house today. I have been out of my own kitchen for 5 weeks (insert crying face emoji) and I am just so ready to be back. I am incredibly inspired after all of my travels and truly can not wait to get into the kitchen and start recreating some of the amazing dishes I had in Greece and Italy. In the meantime, I am breathing some new life into an old recipe here and I hope you like it! I first made these gorgeous kebabs years ago and it wound up being a summer staple that I still make today, so I knew I had to re-intro them for you. I absolutely love the combination of Salmon and fruit (as if you haven’t received that message loud and clear!) and I feel like the sweet and tart flavors of strawberries and nectarine are absolutely perfect compliments. I also like that anytime you make a kebab, you need less protein, and you get more of the sides, like veggies, or in this case fruit! You make a lot of food, they are super healthy and delicious and have the added benefit of being entertaining worthy pretty and SOOOO easy! Remove the skin from the salmon and cut into 1” chunks. Toss them in a small bowl with olive oil to coat and season with salt and pepper. Remove the pit from the nectarines and cut the fruit into chunks just a bit bigger than the salmon. Remove the stems from the strawberries. 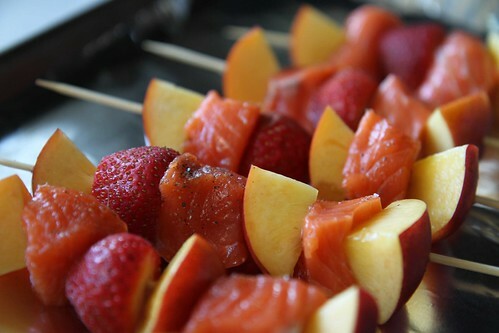 Skewer the salmon in between the chunks of fruit, alternating as you go, with just one strawberry per skewer. 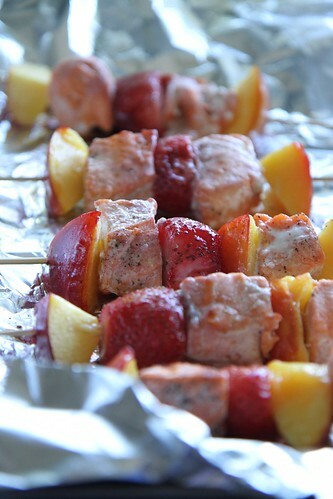 Place the skewers on a sheet of tin foil and drizzle with more olive oil. Heat a grill to medium heat and transfer the sheet of foil onto the grill. Cook the salmon until the flesh is just opaque and there is white fat coming out of the fish. Then turn the skewers and repeat on the other side. Grill heat varies, but this should take around 10 minutes. Transfer the kebabs to a serving dish and serve hot. 1. 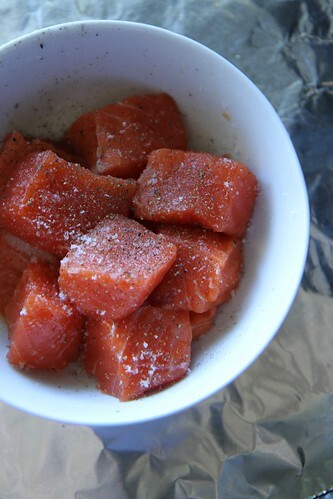 Remove the skin from the salmon and cut into 1” chunks. Toss them in a small bowl with olive oil to coat and season with salt and pepper. 2. Remove the pit from the nectarines and cut the fruit into chunks just a bit bigger than the salmon. Remove the stems from the strawberries. 3. 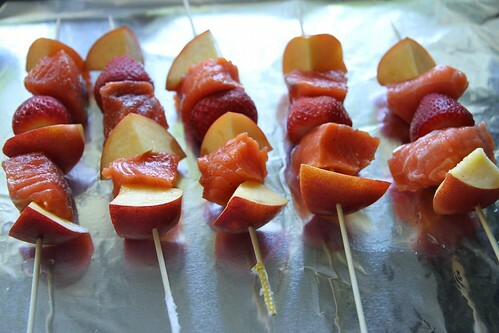 Skewer the salmon in between the chunks of fruit, alternating as you go, with just one strawberry per skewer. 4. 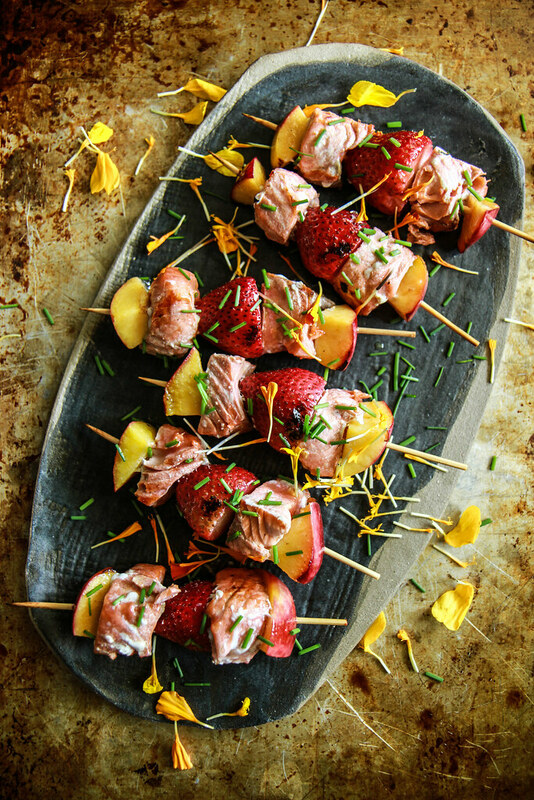 Place the skewers on a sheet of tin foil and drizzle with more olive oil. 5. Heat a grill to medium heat and transfer the sheet of foil onto the grill. Cook the salmon until the flesh is just opaque and there is white fat coming out of the fish. Then turn the skewers and repeat on the other side. Grill heat varies, but this should take around 10 minutes. 6. Transfer the kebabs to a serving dish and serve hot. Oh yum just bought all of this stuff today. What do you think with copper river salmon? 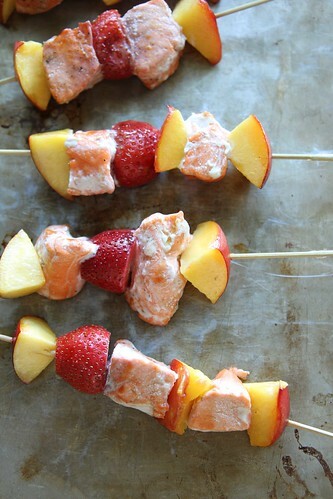 Love the idea of pairing nectarines and salmon – yum!! Maria- the sweet strawberries were surprisingly AMAZING too! Girl time is so much fun and these kabobs sounds awesome! I love all the summer fruit! Love the addition of fruit! Super yum, Heather! Love the grilled fruit! Thank you Kim!! there is something about the sweetness of the charred fruit with a little bit of sour that is perfecto!! Grilled salmon and fruit is fabulous! Thanks Marla! I feel like these would also be delicious turned into a salsa or something and poured over the grilled salmon! Refreshing, healthy and delicious – love! this is seriously like the most perfect summer meal ever! Good luck on the no TV thing. I’m a sissy and probably wouldn’t be able to do it. Law & Order reruns, hellloooooo. It’s more like I can’t stand anymore Nickelodeon!!! These look great – perfect ‘diet’ friendly too! I love the combination of flavors in these gorgeous kebabs, Heather! Amazing recipe. How fun are these kebabs! I could eat a dozen no problem, yum!! I never would have thought of this combo, but I love it! Of course I love to cook and bake, but for some reason the grill intimidates me. These look so delicious and easy I think I can handle it! And nectarines are my favorite fruit…ever! Jennifer- the sheet of foil eliminates all of the stress about grilling (which for me is primarily the freakiness of whether or not the food is going to stick to it! Try these they are easy and delicious! salmon and fruit – what a combination!!! love it! and girl time is always so relaxing and fun! I love this combo! Perfect for summer! Absolutely love this. I served it over a spinach salad with strawberry slices dressed in white balsamic vinagerette and dusted with candied hazelnuts. Thank you for the amazing idea!! Great Shelly!! That sounds wonderful! These look so delicious!! I love grilled fruit!! Will definitely need to give this a try! welcome home!!! that’ a long time, but in a good way. These kebabs are like the perfect welcome home reset dinner. Love it! Salmon is my favorite year-round food! This looks delicious! What a gorgeous combo! And you photographed the flakiness of the salmon BEAUTIFULLY! Yum! What a perfect combo. Definitely making this. Hoping your travels were lovely. 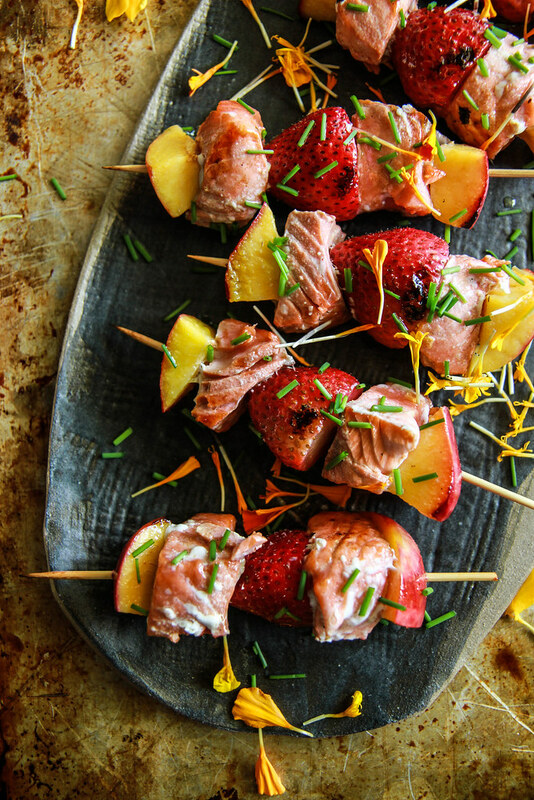 Oh my gosh…these are the prettiest kebabs I’ve laid eyes on! !